Access Self Storage Birmingham Central offers a range of personal and business storage solutions for customers all over the midlands. Offering receipt and dispatch services, complimentary pallet trucks, forklifts, and secure, 24/7 access, there’s no better way for individuals and organisations to store their goods and belongings. Our self storage units in Birmingham are conveniently located in the heart of the city. Starting from Birmingham New Street station, head south on Queens Drive until you reach Hill Street. Once you’re there, continue onto Station Street, then Dudley Street. Continue onto Pershore Street, where you’ll find a roundabout – take the second exit onto Sherlock Street and you'll see Access Self Storage Birmingham. Birmingham and Manchester may duke it out on occasion for the title of “the UK’s second city”, but any one of the one million Brummies residing here will tell you their city is nobody’s runner-up. There’s so much to do in Birmingham that it borders on the absurd. Take the Bullring, for example: not every shopping centre has a tradition of commerce dating back to the Middle Ages. It’s safe to say it’s come a long way since then: after redevelopment in the 1980’s, it’s now the must-visit destination for shoppers all over the Midlands. You’d struggle to name a major retailer that isn’t represented here: from Selfridges to Wagamama; Sports Direct to Tommy Hilfiger. If you come back from the Bullring with more fur coats than you’d find in the average rap video and need to make space to fit them in your home, consider Access Self Storage Birmingham – that way your old stuff will keep until it becomes retro! But Birmingham isn’t all retail. While Scotland may be the birthplace of golf (or at least, the place where it was raised) Birmingham has a legitimate claim to be the sport’s second city. The famous Belfry has hosted the Ryder Cup four times, while the Forest of Arden Country Club hosts PGA tour matches regularly. Still, finding somewhere to store your clubs, clothes, and balls when you’re not trying to lower your handicap at these esteemed venues can be a bit of a pain – why not use our storage units in Birmingham in between tournaments? In fact, in many respects, everyone in Birmingham is spoilt for choice: its 65,000 students are divided between Aston University, The University of Birmingham, Birmingham City University, University College Birmingham, and Newman University. If you’re based at any of these campuses, there’s a good chance you’ll need a storage unit in Birmingham for the summer holidays – our staff would be more than happy to help! Contact us now on 01212 221 934 for a personalised quote. 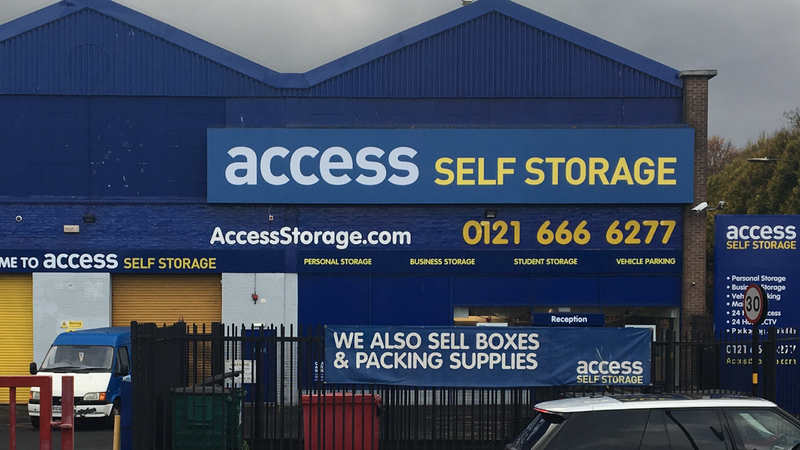 Or if you’re interested in storage in other Birmingham areas, check out our pages on self storage in Erdington and self storage in Selly Oak.